Definition of debugging support macros and functions. This C++ header file contains debugging support facilities. 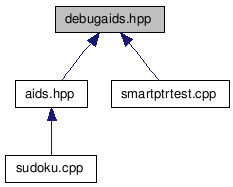 They are implemented in the C++ inline file debugxaids.hpp and the C++ program file debugaids.cpp belonging to the SysToMath Aids C++ Library stmaids. Return the error message msg as std::string. Verify that the boolean condition cond is true. Output message to the system log according to flags.